If you are lover or fan of Nikon’s coolpix series then you are surely familiar with Nikon l810 , now Nikon coolpix l820 is latest camera device from the Nikon having 16MP CMOS sensor and 30x Optical zoom . Nikon l820 comes with very impressive specification and price too . Nikon is highly known for its quality and this time they come with very nice camera ( L820 ) . Nikon did many changes in L820 if we compare it to L810 , we will talk about them in there respective sections . Nikon L820 is the successor to the L810. Nikon coolpix L820 . What’s new ? Nikon did many major and some minor updates over L810 to make finish product that is, Nikon Coolpix L820 . 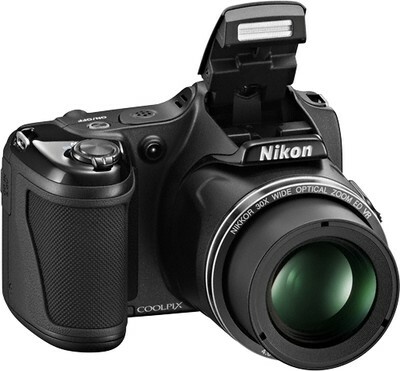 Nikon coolpix L820 comes with CMOS sensor of 16MP with 30X Optical zoom & upto 4X digital zoom . With new Nikon L820 you can record 1080p Full HD video . The 30X zoom lens has built-in lens shift vibration reduction (VR) which helps reduce blur and shake/ vibration in your captured images . The 30x optical zoom lens (Nikkor ) has the wide-angle 22.5 mm to super-telephoto 675 mm . Nikon L820 has 3-inch screen ,921k-dot approx . 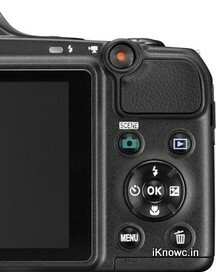 The side zoom control for makes L820 use stable & simple . Nikon L820 is powered with four (AA-size) batteries . Nikon coolpiX L820 has all successor features of L810 plus and addition of features like – CMOS image sensor , 30x optical zoom and 1080p Full HD recording . Nikon L820 does have VR feature for image stabilization . YOU Can capture images in night as well with built-in Flash on the top desk . The camera looks like a dslr and bridge camera . To make camera more approachable Nikon L820 has Easy Auto mode & Smart Portrait system , with functions like red-eye fix & face-priority auto focus , so if you are beginner then you can easily go through Nikon coolpix l820 . The camera has 65 Mb of inbuilt memory and you can break the memory barrier by inserting SDHC and SDXC to memory card slot . 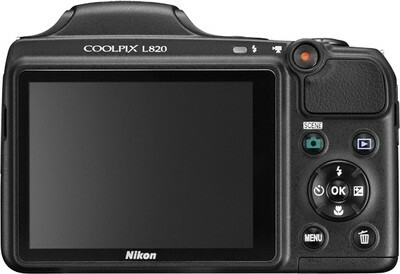 Nikon coolpix L820 comes with USB 2.0 High-Speed data connectivity . L820 has shutter speed of 1/1500 sec and ISO 125 – 1600, ISO 3200(A M) . Coolpix L810 has aperture of f/3 – f/5.8 . For video recording there is dedicated button for video recording which makes video REC easy and fast . you can take 540 shots full charged NiMH rechargeable batteries , which seems to be about 20% more than l810. Nikon L810 weights 470 gram . The camera does have stereo mic . The camera comes with 44x Optical Zoom with Optical Image Stabilization . THe camera has 16M BSI-CMOS High image Quality and Fast autofocus also can record Full HD Movie 1080i/60fps. The camera comes with 42x Optical Zoom with Optical Image Stabilization . The camera comes with 30x Optical Zoom with Optical Image Stabilization . Package INCLUDES – When you buy Nikon coolpix L820 you do get following accessories – Four LR6 (AA-size) alkaline batteries ,Lens Cap , USB Cable, Audio Video Cable, Camera Strap, ViewNX 2 CD . If you want to buy or you are searching for a long zoom camera that not just only fits to your budget but also delivers you Good user experience then Nikon Coolpix L820 is great buy . 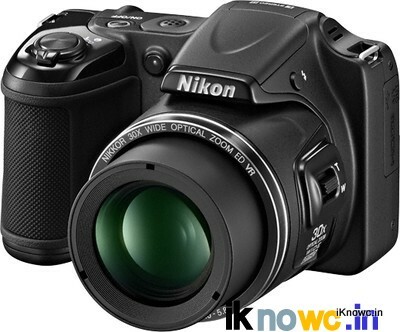 For person who want to buy a video camera under RS 15000 / $ 300 then they should go for Nikon coolpix L820 . We will be more happy if Nikon try to include external MIC . Overall Nikon Coolpix L820 is great zoom camera .